Edges of Color, by Digital Arts and New Media MFA student David Harris, is a series of individually programmed pieces on an 8’ square, 16x16 grid of separately controlled and colored LEDs swatches. Reminiscent of the color swatch paintings of Gerhard Richter or the spot paintings of Damian Hirst, it treats light as the material for display instead of paint. 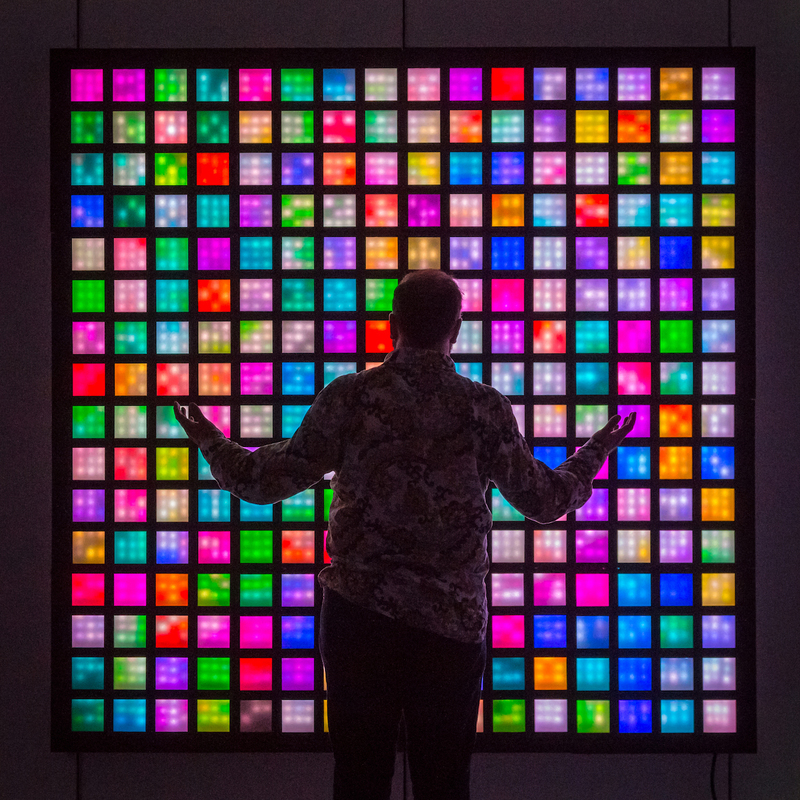 The pieces shown in the color pixel array explore the boundaries of what is possible in a rule-bound, constrained system, reflecting and criticizing notions of creativity, innovation, and conformism as they exist in Silicon Valley culture and the processes of science and technology today. The display above, "Random Richters," is inspired by the artist Gerhard Richter, who created random color swatch paintings in the 1960's -- but were his color selections really random? The only way to generate truly random numbers, which can be converted into colors, is by using quantum physics. This piece draws on a web-communicative quantum random number generator in Australia to choose the colors shown. About the display below, "Unprintable Colors," Harris writes, "Some colors possible with a combination of red, green and blue light can't be printed on paper using a standard 4-color cyan/magenta/yellow/black printing process. This piece explores the colors that can't be printed." Read more at David's website.